Our red bar stool is a great backless bar stool. This barstool works great as a restaurant bar stool as well in other commercial settings. When looking for a commercial bar stool, you need look no further. 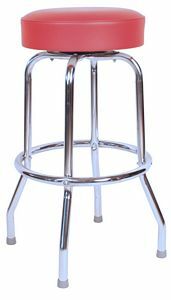 Our 30" barstool uses a 19 gauge chrome plated bar stool frame. This steel bar stool frame is what allows our bar stools to last so long in the field. This bar stool is manufactured in the USA. Seat Height: 30" or 24"